HOW TO DESIGN INSTAGRAM STORIES GRAPHICS THAT CONVERT & CONNECT // 5 TIPS FOR DESIGNING COHESIVE SOCIAL MEDIA GRAPHICS. Happy Wednesday! 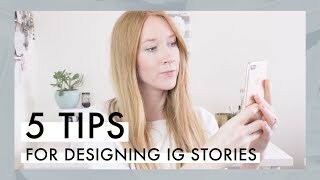 Today I’m sharing my top tips and hacks for designing Instagram Stories graphics. Instagram is still one of the top social media platforms and with the new algorithm, you need to be more consistent than ever to connect with your audience. Use these tips to grow brand recognition, connect with your customers / clients and send traffic to your website. You have to be consistent and branded to make a lasting impression and reach your ideal clients or audience. *All opinions are my own. Affiliate links will be marked! hi! you have realy good content!! but you do not have so much views, thats sorprese me, my be you are not doing good marketing of your videos? i dont know… I love your content!